Lochac’s Worshipful Company of Broiderers (WCoB) have a tradition of creating Royal gifts for those who have reigned. Countess Mistress Bethony requested a pattern darned towel. I have made a pattern-darned towel in the style of a 15th to 16th century German imitation of a contemporary Italian Perugia towel, which could be put to a variety of period uses detailed below. The towel will be presented to Baroness Bethony Gaitskell at Twelfth Night AS53 (January 2019) in her home Barony of Krae Glas. Perugia towels are named after the Italian city that represented the major production centre for these items. 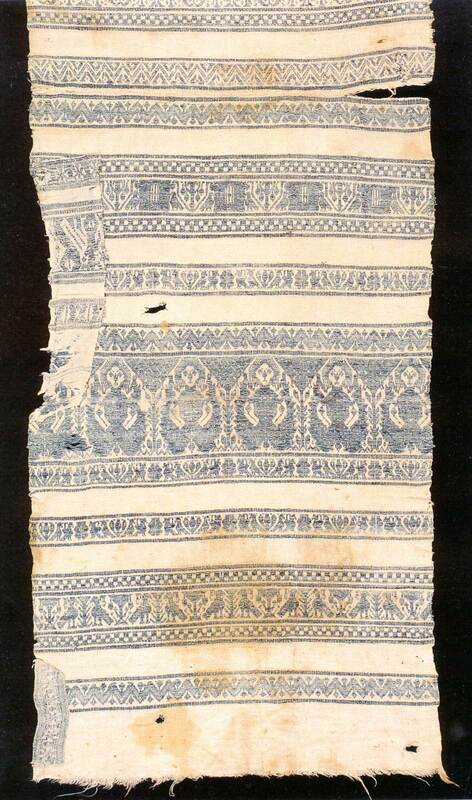 These towels were made of a white base cloth with typically indigo-dyed woven motifs (motifs were also occasionally red or brown) woven in strips influenced by the style of Islamic bands. Motifs were varied, including (but not limited to) flora, fauna, humans, buildings, geometric shapes, and words. Wedding-feast, Histoire d’Olivier de Castille et d’Artus d’Algarbe (BNF Fr. 12574, fol. 181v) (used as tablecloths at a wedding). Detail from Die Geburt Mariens (The Birth of Mary) by Oberrheinischer Meister circa 1460-65 (used as an apron), AKG-Images (see Figure 1). Figure 1: Detail of a woman wearing a cloth woven in the style of a Perugia towel as an apron from) from Die Geburt Mariens (The Birth of Mary) by Oberrheinischer Meister circa 1460-65. The white sections of Perugia towels appear to be commonly woven in a diamond twill or broken diamond twill pattern with a linen warp and weft, with the coloured sections woven with a coloured cotton weft that appears to be plain woven with fringing at each end (see figures 2 and 3). Figure 2: Detail of a Towel, Perugia (Italy), 15th – 16th century, linen and cotton, accession number 1974.283.2. Figure 3: Detail of a Perugian Towel, 1500, Linen diaper weave with supplemental cotton weft decoration, 12.020. The coloured bands tended to be all the one colour (see Figure 4), though there is at least one extant multi-coloured example (see Figure 5). These coloured bands were woven into the fabric as it was made. Figure 4: Towel (Italy) woven in white and brown, accession number 1945-33-1 (Cooper Hewitt, last accessed December 2018). Figure 5: Towel (Italy) woven in white, olive green, blue, yellow, and red motifs, accession number 1950-122-3. This item is not dated; however, it is evidently similar to the style of Perugia towels. Although true Perugia towels have the pattern woven in, I didn’t want to take this route. This project is a gift from the embroidery guild so I wanted to ensure embroidery was present in the piece. There is, however, evidence of faux Perugia style towels that were pattern darned rather than woven. In particular there are references to 15th century German pattern darned towels in this style. It is, therefore, unsurprising to find examples of, and references to, German imitations of Italian Perugia cotton-linen towels from around the fifteenth century. The idea of making an imitation sang to me. To achieve my own imitation, I decided to weave a piece in the style of a Perugia towel, and pattern darn the design into it (similar to the examples of German imitations of Perugia towels). Pattern darning is a simple style of embroidery that uses running stitch create a design on fabric sequentially line by line – similar to the way a printer applies ink to paper. The nature of this stitch means that the design appears on the front of the fabric, and in negative on the back. This stitch was common to many locations through late medieval and early renaissance Europe and the Middle East. It is evident in surviving pieces from 15th– 16th century Germany, and further afield, in 12th– 16th century Egypt and Syria, 15th-17th century Iceland (known as ‘skakkaglit’), and 16th– 19th century Japan (known as ‘kogin’). A 15th century German towel end with a ‘needle run border’ (Figure 7). Figure 6: Towel with patterned stripes ca 1460 (Augsburg), made of chain linen, weft linen, cotton, silk, metal thread, canvas, twill, rib weave, bobbin lace. Figure 7: Front (top) and back (bottom) of a 15th century German towel end with a ‘needle run border’ in coloured silk that imitates the towels with woven pattern ends which were produced earlier in Italy’. I found a third towel, which may be Italian or German, and is dated to the 16th-17th centuries – made of cotton and linen. If it was indeed produced in Germany, it could be another example of a Perugia towel imitation. Figure 8: 16th-17th century Italian or German towel made of cotton and linen. The extant pattern darned towel from Augsburg (Figure 6), a well-crafted imitation of a Perugia towel, is the primary inspiration for the form of this piece. The extant ‘needle-run’ towel end (Figure 7), is another primary inspiration for embroidering the towel instead of weaving in the pattern. Perugia towels are listed as being made from linen and/or cotton, commonly with a linen warp and weft with the pattern woven with a coloured cotton weft. The materials listed for the imitation pattern-darned German towel are linen, silk, wool, and gilt thread. As this would be my second attempt at weaving (and first without skilled supervision), I sought advice from skilled weavers. Although the extant examples were usually woven as a linen warp and cotton weft (not sure, but you should know), problems for a relatively new weaver working in these materials require the warp has to be constantly wet to keep the linen sufficiently elastic, which is not only time consuming, it rusts the reed of the loom. Mistress Cairistiona Nic Bethain and Mistress Victoria Thrakeses suggested using a linen-cotton blend for both the warp and weft, as it was available from Petlins as Cottolin 22/2, and retains in essence the correct fibres for the project. Whilst it is unlikely that cotton-linen blend was used historically for this kind of towel, I believe this is a fair compromise between my weaving skills and the original fibres as described in various museum pieces. In images of pattern darning, the thread used to make the pattern appears to be a similar thickness to the warp and weft threads of the towel. In the woven patterns in Perugia towels, though, the cotton weft appears to be a little heavier than the linen weft (see Figure 4). I wanted to ensure that the finished item was as versatile and washable with modern products as possible so, to avoid shrinkage, I matched the red pattern thread to the woven item and chose to pattern darn in red Cottolin 22/2. In terms of colour, I used 0020 for the white (as it is a balance between natural and bleach-white) and 248 for the red (which appeared to be a similar shade to those used in 15-16th century embroidery (for example, see the napkin/towel with red inserts). I was intent on using red rather than the more common indigo colour because it is a favourite colour of the recipient, and present in her device (Figure 9). Figure 9: Personal device of Bethony Gaitskell. I canvassed several images of Perugia towels to get inspiration for the types of patterns I could use in my piece. Perugia towels tend to have several bands of varying widths and motifs, some plainer and some more detailed. The placement and number of these bands vary between the towels. I decided to use the band structure evident in Figure 10 as the basis of my pattern structure, with each end of the towel woven with a thick band of colour bordered by two thin bands as the primary detail, a gap on either side, and then bordered in two more of the thin bands. Figure 10: Towel woven of cotton and linen (Italy) demonstrating the coloured pattern structure I chose to emulate, 15th to 16th century, museum number 1017-1800. Several of the extant towels I found have a checkerboard design as standalone bands, and as borders around other motifs of larger bands (Figures 11-14). I liked how striking the checkerboard bands look on the towels. Figure 11: Umbra Tela textile collection, including a towel at the bottom left that includes the checkerboard borders. Figure 12: Detail of 17th-18th century cotton towel fragment from Italy. Accession number 1902-1-37. Figure 13: Detail of a tablecloth demonstrating the checkerboard pattern from Last Supper from the Schotten Altar, 1469, Vienna, Austria. Figure 14: Detail of a Perugia style cloth demonstrating the checkerboard pattern. I think this design feature will resonate with the recipient because her husband’s personal arms include checks (Figure 15). As they reigned together, this is a reign gift, and the design itself is striking to look at, I chose to incorporate the checkerboard borders into my design. Figure 15: Personal device of Gilbert Purchase. As mentioned earlier, there are many motifs found in these designs, including flora, fauna, humans, geometric designs, words and buildings. There are examples of repeats of the same band, or different bands punctuated by plain/simple bands. I decided to use roses to link to the recipient’s admittance to the Order of the Rose upon completion of her reign. Whilst I did find images of flowers (for example, see Figure 16) I didn’t find any patterns in extant Perugia or imitation towels that looked right to me, and so I went searching further afield to find something more fitting for the recipient. Figure 16: Detail of 17th-18th century cotton towel fragment from Italy. Accession number 1902-1-37. A whole host of designs were published in pattern books (also known as model books or modelbuchs) in the renaissance. The style of the patterns varies anywhere from rigidly geometric to freeform and common motifs included repetitive geometrics, flora and fauna. Given that model books were often used for embroidery and illumination (as well as other crafts), patterns can also be adapted from elements found in contemporary illuminated manuscripts, resulting in shared motifs and patterns across the different art forms. There are sections in various modelbuchs (embroidery and lace) with band designs that that imitate the structure and motif content of Perugia towel bands and can be replicated in pattern darning. In a 1909 facsimile of I Singolari e Nuovi Disegni [Singular and New Designs] (Vinciolo, 1609) I came across a rose motif with leaves (Figure 17) that looked appealing and could be repeated to make a band for a Perugia-inspired towel. Figure 17: Pattern of a rose from page 62 of Vinciolo (1609, last accessed January 2018). Figuring out how long the warp needed to be, and how many warp threads to use, was an exercise in maths and looking up advice on the internet. Therefore, to weave one towel I need ~220 cm (86”) warp length. During the Politarchopolis University event in 2016, I was taught to weave by Mistress Victoria Thrakeses. The pattern I used to learn with was a broken diamond twill, which turns out to be quite convenient for completing this project. Perugia towels were woven in a combination of diamond twill or broken diamond twill, and plain weave. To achieve this, I set up the weft across the four shafts of my table loom by repeating a broken diamond twill pattern on the heddles: 34,1234,12,4321,4321. 4 = depressing shafts 4 and 1. To achieve the plain weave, I alternated depressing shafts 1 and 3 together, and then 2 and 4 together. The result of this project was a towel that has the aesthetic of the bands in Figure 8, the fringing knots evident in Figure 1, and the concept of embroidered imitations of Perugia towels from Figures 6 and 7. I’m pleased with the outcome and I think it looks appropriate to the style I was emulating with this project. The embroidered towel end (Figure 7) used silk embroidery, whereas the Perugia towels used a linen warp and cotton weft. I began embroidering the cotton-linen towel I wove with silk and it didn’t sit well or look very nice. I decided, instead, to substitute cotton-linen to embroider the towel. This is not in line with Figure 7, but it is still analogous to the Perugia towels this piece was aiming to imitate. With the weaving itself, I had many troubles due to my inexperience with weaving and due to the setup of the loom I purchased. The weights at the bottom of the heddles would not pull the warp down far enough, making it easy to drop warp threads and difficult to maintain an even tension in the weaving. This resulted in a varying weave tension, and the edges were not perfectly straight. Before using this loom again, I would need to add springs to the bottom of the weights attaching them to the bottom of the loom to prevent this issue from occurring again. The varying weaving tension made pattern darning tricky at times, but I managed to use a small embroidery hoop and my extensive experience in embroidery tension to make it work without puckering the base fabric or making sagging stitches. I am pleased that I pattern darned neatly so that the reverse side of the piece looks as striking as the front. I completed the pattern darning vertically, rather than horizontally as weaving would have been. This was primarily because it was easier to use an embroidery hoop that way to keep a nice tension on the design. It was unclear to me in the extant pattern darned pieces whether they were executed vertically or horizontally. If I were to make something like this again, I would be curious to try and weave the pattern in rather than use pattern darning. The towel will be presented to Baroness Bethony Gaitskell at Twelfth Night AS53 (January 2019) in her home Barony of Krae Glas. Figure 18: Completed towel displayed as an apron, made by Ceara Shionnach 2017 and 2018. Figure 19: Completed towel front, made by Ceara Shionnach 2017 and 2018. Figure 20: Completed towel front detail, made by Ceara Shionnach 2017 and 2018. Figure 21: Completed towel back, made by Ceara Shionnach 2017 and 2018. Figure 22: Completed towel back detail, made by Ceara Shionnach 2017 and 2018. Hanson, 2003; Berry, 2007; Boston Museum of Fine Arts, last accessed 2018; Miller, 1996; Lubeck, 2013. Boston Museum of Fine Arts, last accessed 2018. Staniland, Kay. Medieval Craftsmen: Embroiderers. London: British Museum, 1991. Germanisches Nationalmuseum (last accessed December 2018). Closer images can be found published by Sue Zie, last accessed December 2018. The Metropolitan Museum of Modern Art, accession number 09.50.1257. The term ‘needle-run’ was not defined in the source, however, it could feasibly be a synonym for a pattern darning type stitch (which is fundamentally a running stitch). Figure 2 (The Metropolitan Museum of Art, last accessed January 2018), Figure 3 (Rhode Island School of Design Museum), Figure 4 (Cooper Hewitt, Smithsonian Design Museum, accession number 1945-33-1 last accessed December 2018), Figure 8 (Victoria and Albert Museum, museum number 1017-1900, last accessed December 2018), Figure 10 (Accession number 1902-1-37, Cooper Hewitt, Smithsonian Design Museum (last accessed December 2018), Figure 14 (Accession number 1902-1-37, Cooper Hewitt, Smithsonian Design Museum (last accessed January 2018). Image from Lochac’s Roll of Arms (last accessed January 2018). Boston Museum of Fine Arts (last accessed January 2018). Sampler fragment, Mamluk (Egypt), linen plain weave embroidered with silk, accession number 48.1053.
Cooper Hewitt, Smithsonian Design Museum (last accessed December 2018). Towel Fragment (Italy), 17th–18th century; cotton; Warp x Weft: 52.1 x 33 cm (20 1/2 in. x 13 in. ); Gift of John Pierpont Morgan; 1902-1-376. Towel (Italy), accession number 1945-33-1. Towel (Italy), accession number 1950-122-3. Germanisches Nationalmuseum (last accessed December 2018). Handtuch mit Musterstreifen – Towel with patterned stripes ca 1460 (Augsburg), made of chain linen, weft linen, cotton, silk, metal thread, canvas, twill, rib weave, bobbin lace. The Metropolitan Museum of Art (last accessed December 2018). Towels, Perugia (Italy), 15th – 16th century, linen and cotton, accession number 1974.283.2. 16th-17th century Italian or German towel made of cotton and linen, accession number 09.50.1257. Rhode Island School of Design Museum (last accessed December 2018). Perugian Towel, 1500, Linen diaper weave with supplemental cotton weft decoration, accession number 12.020. Victoria and Albert Museum (last accessed December 2018). Napkin, made in Italy or Spain, 1500’s, linen with inserted bands of woven linen and silk, museum number 234-1880. Towel, Italy (probably, made), 15th century to 16th century, woven cotton and linen, museum number 1017-1900. Towel, part, Perugia (probably made), 16th century, Linen in twill weave with supplementary cotton wefts, museum number 1018-1900. Towel, Italy (probably, made), 1400-1500, woven linen and cotton, museum number T.12-1916. Towel, Italy (probably, made), 1400-1600, woven linen and cotton, museum number 487-1884. Towel, Italian, 1500-1699 (made), woven linen, museum number 226-1904. Towel, Italy (probably, made), 15th to 16th century, woven linen and cotton, museum number T.13-1916. Vinciolo, Federico. A 1909 facsimile of I Singolari e Nuovi Disegni [Singular and New Designs], 1609, 98 pages, as published by the University of Arizona. AKG-Images (last accessed December 2018). Die Geburt Mariens (The Birth of Mary) by Oberrheinischer Meister circa 1460-65. Mack, Rosamond E. (2002). Bazaar to Piazza, p47-49. Published by the University of California Press. Mazzaoui (1981). The Italian Cotton Industry in the Later Middle Ages, 1100-1600, Cambridge University Press. Historical Needlework Resources (last accessed January 2018) – Patterns and Modelbuchs. Riello and Parthasarathi (2011). The Spinning World: A Global History of Cotton Textiles, 1200-1850, OUP/Pasold Research Fund. Berry, Robin L. (2007). Pattern Darning: A Running Stitch in Patterns. Last accessed January 2018. Booker, Cally (2015). How Long Should My Warp Be? Learn to Weave With the Perfect Length of Yarn. CittadiCastellonLine.it, last accessed December 2018. Umbra Tela textile collection, Renaissance Umbrian tablecloths. Diu Minnezit (last accessed December 2018). Lager und Einrichtung – Handtuch Perugia Art (translated through Google Translate). Hanson, Carol (2003). Introduction to Pattern-Darning. Last accessed January 2018. Lochac Roll of Arms (last accessed January 2018). Bethony Gaitskell, registered 18 April 2014.
von Lubeck, Genoveva (2013). Mary of Hapsburg’s Hemd: Chemise Pleatwork and Pattern Darning Notes. Last accessed January 2018. Mamaeva, Olga (last accessed January 2018). Prunkhandtuch Weber Hans Velmann, Augsburg, about 1460-70 Linen, wool, silk, Hautchengold Gew 634 (translation by Google: Luxury Towel Weber Hans Velmann, Augsburg, c. 1460-70 Linen, wool, silk, skin gold, weight 634). Miller, Joyce (1996). Icelandic Altar Hanging. Last accessed January 2018. Pinterest via Institut fur realienkunde (last accessed December 2018). Detail of a tablecloth from Last Supper from the Schotten Altar, c15th century, Vienna, Austria. Sarah (18 November 2009). Pattern Darning. Prunkhandtuch 1460 bis 1470 (Augsburg). Detail from a German towel from Augsburg (Germany). Prunkhandtuch ca 1460 – 70 (Augsburg) Wolle, Seide, Leinen, Häutchengold. Towel of wool, silk, linen & gilt thread. Wolfeargeant (last accessed December 2018). Photo of a Perugia style towel (possibly from Castoria Umbria).